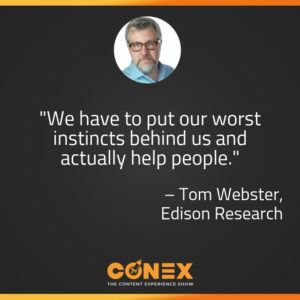 Tom Webster, VP of Strategy and Marketing at Edison Research, joins the Content Experience Show to discuss how to succeed as a brand in voice search. For so long, the name of the game when it comes to search has been visibility. With the rise of voice search, however, the visual side of things has completely disappeared from the equation. It makes sense, then, that businesses devote substantial energy to becoming that first search result. Without the ability to scroll through results, a number-one ranking may be the only way to get your brand “in front” of your customers. But what Tom Webster of Edison Research proposes is to become the search, rather than fight for your position in the search. By building a strong brand outside of the device and developing helpful, trustworthy skills for the device, your brand can transcend the search. Rather than relying on the consumer to stumble upon your brand in voice search, utilize the abilities of the device to become the source your customers go to for help. How smart speakers have changed behavior and media consumption. Why a strong brand off-device means a strong brand on-device with smart speakers. How smart speakers became one of the fastest-growing trends in consumer technology. How the marketing landscape has changed with the rise of voice search capabilities. Get the free Content Experience Report here. Download the free Smart Audio Report from NPR here. What is a fun or silly thing you are doing with your smart speaker? Every morning, Tom and his family say “good morning” to Alexa, and she often has fun, humorous responses! Welcome to The Content Experience Show where content experience is the new content marketing. It’s not only about reaching our audiences where they are, but engaging them with a personalized experience of meaningful, useful content that they’ll take with them over time. The guests on the Content Experience Show share strategies, tips, and real-world examples of how they’re taking their content marketing to the next level and providing their current and prospective customers with a true content experience. This isn’t just a trend. It’s a movement. It doesn't get any better for content marketers. They present a balanced, insightful discussion of current trends and ask all the right questions. Their guest list is a "Who's Who" of content professionals. Outstanding. I love listening to marketing podcasts and this one is on my must-listen to list. Very knowledgable hosts and topical discussions. Randy: Hey Alexa. Anna: Oh, Randy, no. This is Anna. Randy: Oh, right, right. You caught on really quickly there, because we didn't rehearse that at all and- Anna: We didn't. I knew where you're going. Randy: Either I was going to call you Alexa or Siri. I couldn't decide what to do. But, for those listening, if I set off your smart device, I apologize. We'll throw a Google right now. We'll throw an Echo. Will throw pretty much every device. Anna: [inaudible 00:00:25]. Randy: Exactly. People are just hitting "stop," please stop playing. But, don't stop playing this podcast. This is going to be a fun one. We dig in with Tom Webster to the ideas of, how is the smart device changing our homes? How is it changing our behaviors? How is it changing the way we look for content? If you don't know Tom, he's at Edison Research, where he's vice president of strategy and marketing, and they do really cool research. They're pretty much powering elections on a day-to-day basis, and somehow in between, they figure out how these smart devices work out. Out of a ton of fun. You, Anna. Anna: Yeah, no, this is amazing. And Tom has some amazing insights and also delivers it with some fantastic humor in there as well. This episode, I think for me, was really fun too because, Randy, we talked about this a little bit on the show, but basically there's been this whole push in our industry to be like, "Get ready for voice search," but then it's just sort of like question mark, "How do we do that?" Everybody's like, "We know we need to go this direction, we know we need to be prepared for smart speakers." But Tom actually helps us get there. Randy: Yeah. What I found interesting, and this was in the second half of the podcast, you have to listen through to hear this part, was that there's two different ways that we're interacting with the smart device. One is interactive, and one is, "Give me the quick answer. I just want the result." Right? And it's [inaudible 00:01:53] this opportunity. I often just think of that first, sorry, that latter one, which is, "Tell me how long it takes to boil eggs," as I gave the example in the podcast or, "Tell me how long it's going to take me to get to work right now." Very quick access to information. But, the light that I got from Tom, and I'm trying to think what apps we could build at Uberflip for this is, what if we could deliver value by giving people the opportunity to go through an interactive assessment through these devices? Anna: I like that you're already thinking that, because all I keep thinking is about how we pretty much should just blame voice search and smart speakers and Dora the Explorer and teaching us to talk to things. I just keep making that dotted line back to Dora the Explorer. Randy: Dora is scary. My kids used to watch Dora on YouTube, but YouTube would recommend all this other content after another and obviously [inaudible 00:02:50] the backpacker something like that. And you're just like, "How did that happen? How did it get so dark so quickly?" And I guess it's just matter of time until we get there with voice and someone on the other line is telling us some scary things, but for now we're going to hear some great things. I think you got to kick it off with Tom. 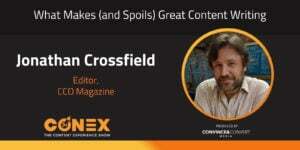 So let's roll this week of the Conex Podcast. Anna: Hey, Tom. Thank you so much for being here with us today. I should actually say, "Thank you for being with us, again." You were on the podcast a couple of years ago back when it was Content Pros, so thank you for coming back and chatting with us. Tom Webster: Yeah, I hope I can eventually get a five-timer jacket, like the ones they give out on SNL. Anna: Yeah, I was just thinking that now. 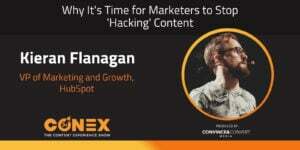 Yeah, you can be the Steve Martin of Content Experience Show. Tom Webster: Let's hope. Yeah, I get my five-timer jacket. My content five-timer jacket [inaudible 00:03:42] now for that. Anna: Nice. For those who are just tuning in, who maybe didn't catch the last episode that you were on, would you mind giving everybody just a little bit about you? Tom Webster: Sure. I'm senior vice president at Edison Research, which is a probably best known in the US as the sole providers of exit polling data to the national election pool, which is all the news networks basically that you see election and primary and caucus coverage on, all of that exit poll data comes from us. It's a job that's really demanding. And so, obviously, they don't let me touch that part of it, but I do a lot of custom research in the tech space. I do a lot in the audio space. Certainly I've done a lot in podcasting, and now we're doing a lot of research on another aspect of the Audio Pie, the smart speaker universe. We've done a ... I know we're going to talk today about this, but we've done studies for a number of companies sort of privately, and we've got public data that we're going to talk about today that we've done in partnership with NPR. The audio space is pretty hot right now, actually. A lot of things are up. Podcasting consumption is way up, audio books are way up. All of that falls under my purview at Edison. Anna: Nice. Which is funny because I feel like marketers for the longest time in general haven't touched audio, and 2017 and 2018 was "The year of video." But, let's just jump right into it, because the smart audio report that you conducted with NPR has some fascinating research just about the rise of audio. Even as you just alluded to. I mean, it's exploding, it's continued to grow and there's a lot of fascinating research. What exactly, again, even though you're on the fifth sort of iteration of the smart audio report, what exactly is it, and what are you trying to measure? Tom Webster: Right now, when we started the smart audio report, we had this theory that the smart speaker as it were, the Alexa devices, the Google Home and even the Apple HomePod and things like that, they actually might change behavior. I mean, we don't do the ultimate food processors study for instance, the ultimate fidget spinners study. We don't think those change behavior. But we wondered what would happen when these devices got into people's homes, and people got used to talking to computers, how that would change human behavior ultimately, but certainly how would it change media consumption. So we started down this path with our partners at NPR. They obviously have a keen interest in audio and the audio space and our hypotheses were correct. They do in fact change behavior when they start to get into people's lives and people start to understand what they can do. The rich insights that we've been able to pull out, both through quantitative research and also ethnography, have been really eye opening. Besides the survey work that we've done, we actually moved in with, I think at this point, 45 or 50 different families. Legally moved in, I should say. And basically watched them interact with these devices, how they use them, how they address them, what kinds of things they asked, to be able to see in situ how people incorporate them into their day-to-day routine was super illuminating. It's a really fascinating body of work. Randy: Okay. I got to jump in, I had a question all cued up and then you told me that you moved into people's houses, I got to understand that more. Was this a sleepover situation? Because I use my smart speaker a lot at night and there's probably a lot you could learn from that. How in the house were you? Tom Webster: For several hours, some of them in the morning, some of them mid day, some of them midnight, and all over the country too. We got to see some things that an initial survey might not have uncovered. One of the things that our first iteration of both the survey and the qualitative work pulled out was this interesting relationship with parents and children. So many parents bought them for their kids, or at least in part, so that their kids could interact with them. You see the kids using them, the kids using them to play games, the kids asking them for content, they used to have to ask dad to play "Frozen" on dad's Spotify, on his laptop, and now they can ask for it themselves over and over and over and over. And it's an interesting thing. I know, our friend Mitch Joel often talked or talked in the past about, when you have a young child in the house and they get a TV, their natural instinct is to go up and try and pinch it and zoom it like it was an iPad. Now I think that children of the smart speaker generation will begin to expect that you talk to devices, that you talk to computers. And that's just how you operate them. Indeed I think going forward this technology is going to get baked into a lot of things, so the kids aren't wrong. Randy: No, absolutely. It's funny. My kids are 11, nine and seven and few years ago at Uberflip we gave everyone holiday gifts from my team and we do that every year. We gave everyone a Sonos. It wasn't the smart Sonos where you speak to it. I know they have that now with things built in, but year one, when I brought that home, my kids loved it, right? But the next year we gave everyone Google Homes and now we kid that the Sonosses are just very expensive paperweights in the house because my kids have zero interest in taking the time to type something out. Tom Webster: Well, my friends at Sonos are not going to love hearing that, I have to say. But- Randy: [crosstalk 00:09:21] and I'm sure we can change the kids. Anna: We can balance it. I use mine every day, I love it. It's not a paperweight in our house. Randy: [crosstalk 00:09:31] I have Sonos in my walls. I have Sonos at, what's it called? The play bar? Is that the one that [crosstalk 00:09:37]? Tom Webster: Yeah, yeah. The play bar. Randy: Great product. Great product. Let me ask you, I'm curious. I took a look at the smart audio report, which I just find fascinating because this thing is taking off so quickly. And one of the things in there that you highlight is the new product adoption curve. We've all seen these before, starting off at innovator and progressing through from adopter to majority and eventually laggard. Maybe you can contrast for us and I am going to put you on the spot. The takeoff of this versus the fidget spinner, because you brought the fidget spinner into this. So, we got to see, how fast is this compared to the fidget spinner? Tom Webster: Yeah, I think it's faster than the fidget spinner. I think the fidget spinner was popular in pockets. I can't say, Randy, that our body of research on fidget spinning is as deep as our body of research on smart speakers. But, it's a pretty rapid adoption curve. The first trend that we tracked from two years ago to last year was from 7% of the US population owning one to 16%. And that's faster than smartphone penetration went up. That's faster than social media went up. That's faster than podcasting went up. It was, in fact that year-over-year trend was the steepest adoption curve we've seen for a piece of consumer technology. The interesting thing from last year to this year is that on the one hand you might be tempted to think that it is slowed, because it's gone from 16 to 21. It's still grown at significant percentage year over year, not as much as it did in the first year that we tracked. But, what's gone bananas are the number of devices that people own. Now, the majority of people who own a smart speaker, the majority own more than one. You're more likely to own more than one than just one. So, the number of devices in people's homes, year over year, has more than doubled. And that's putting computing into rooms of the house now where computing did not used to happen. It's putting a computer in your bathroom, for bathroom computing. It's putting a computer in your bedroom, it's putting a computer in your kitchen. And that's changing media consumption. That's changing a lot of things. Anna: It's crazy too the stat that you have in the report about how, in the 2018 holiday season alone, 8% of people in the US got a smart speaker. I mean, that's just insane that it's even now just becoming a gift that people give people. We're giving people computers now. Tom Webster: Yeah. Because they work on multiple levels. I mean, we do have research in this report that shows that there's some FOMO that people have, or at least anxiety, that they're not using the devices to their fullest capacity. Most people will agree that they don't know everything that they can do. But that doesn't matter, because you can also just sit it on a shelf and say, "Play some music." That's fine for most people, right? That's actually the key to getting these devices in mainstream homes, is the fact that they do mainstream things. But as people do get them into their homes, they start to do more and more things and in the first couple of iterations of the smart audio report, we track the number of different skills that people might do, you attract dozens and dozens of them. And the average smart speaker owner does at least eight things a day, eight regular different things with their smart speaker. It's a litany of the mundane, it's everything from laundry timers and kitchen timers, to just getting the weather and the traffic. But all of that adds up. And, as they start to take little things off our hands, we start to trust them more and more and we start to use them more and more. Randy: Tom, I want to take us to break in a minute here, but before I do, can you give us, just name off, what are some of those eight things that people are using it for other than music and maybe an alarm in the morning? Tom Webster: Yeah, music is certainly one, the biggest one. Music's the primary reason why people buy these devices in many cases, but we also took a look at the top indexing activities by day part. And I want to explain, these are not the top activities by day part, because music is number one across the day. But if you look at the activities and skills that punch above their weight, that over index against their average by each day part, as I mentioned, it's a litany of the mundane. In the morning, the top indexing activities, are traffic, weather and news. Indeed, we see a lot of substitutive behavior here with smart speakers, where people are using them in the mornings in place of that background television watching, putting on one of the network television news programs in the morning. They're instead going to their smart speakers for this basic information. Across the day, people use them to listen to music, to add to a shopping list, add to a to-do list, little reminders when their hands are full. As we get around dinnertime, two of the top three indexing activities are either, find a restaurant or a business, or to order food, which makes a lot of sense. Then finally, in the evening, it's a lot of winding down activities, controlling devices, light timers, reading an audio book, short stories and so on. What all of this sort of wrapped up tells you, is that people are using these, not as a gadget, "Look at this cool thing that it can do," but as just a constant companion to do the everyday things in their life. That's the key to, I think, their increased adoption and why people are buying more and more of them to put in more and more rooms of the house. Randy: I'm absolutely loving this episode, and I think you just set up the second half perfectly, because all marketers are sitting there being like, "Oh my God, what do I have to do to adapt to this?" We'll dig into that right after this break, right back with Tom Webster. Jay Baer: Hi Friends. 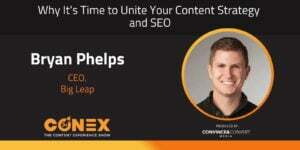 This is Jay Baer from Convince and Convert reminding you that this show, The Conex Show Podcast, is brought to you by Uberflip, the number one content experience platform. Do you ever wonder how content experience affects your marketing results? Well, you can find out in the first ever content experience report where Uberflip uncovers eight data science-backed insights to boost your content engagement and your conversions. It's a killer report and you do not want to miss it. Get your free copy right now at uberflip.com/conexshowreport. That's uberflip.com/conexshowreport. And the show is also brought to you by our team at Convince and Convert Consulting. If you've got a terrific content marketing program but you want to take it to the very next level, we can help. Convince and Convert works with the worlds most iconic brands to increase the effectiveness of their content marketing, social media marketing, digital marketing and word-of-mouth marketing. Find us at convinceandconvert.com Anna: Hey everybody, welcome back. We are here with Tom Webster and we've been talking about the rise of smart speakers and what this means as far as usage goes. But Tom, one of the things that I really want to talk to you about is what this means for marketers. Because it seems like, especially for me coming from the content marketing industry, there's been this huge push to be like, "Everybody prepare for voice search, everybody get ready. People are talking, they're searching differently. It's different than organic search, so go prepare." But there doesn't seem to be a plan to do so or even sort of indication on next steps. What does, first, this actually mean for marketers? And second, how can we actually prepare to do this the right way? Tom Webster: Well, as soon as I first had an inkling of what smart speakers and voice assistant technology would be able to do, I had the same thought as many people in our business. How can we ruin this with marketing? Anna: All right. Exactly. Tom Webster: And I'm here to tell you it's very easy to do. One of the things that I mentioned in the first segment was how people begin to trust these devices. That's word number one that a marketer needs to put at the top of their list. And that is trust, because as soon as that trust is violated for any reason, then these devices will go into a junk drawer. It is not escaped millions and millions of people in this country and in others, the fact that these things are always listening. So, there has to be immense value and trust in order to overcome that. There are two ways to violate that trust. There's the sort of obvious ways which are, it exposes your financial information or something like that. But then there's also, if it's intrusive with things like advertising where it's not welcome, and I know that both Amazon and Google and certainly Apple too are all very cognizant of this. They're not going to be running ads to sponsor your asking for the time. But skills I think are an extraordinarily important part of what marketers can think about and what they can address, because what does a skill do? A number of things that I've already mentioned that people use these devices for, they're to help them. They're to help them when their hands are full, they're to help them with common everyday tasks. I think if marketers place trust as number one, and helpfulness as 1B maybe, and use that as their filter, then things will naturally suggest themselves. They really do have to be helpful. They really do have to be trustworthy. To me, the ultimate audio app of all time is decades old, decades. It predates smart speakers by years. And that's the Butterball Turkey Hotline, and we've all called it at some point. When I've had my turkey in the oven for five hours at 200 degrees, and I wonder what's wrong, there's a helpful human on the other end of the line that's going to help me save my turkey, or at least tell me to throw it out before I kill my family. That's the way I think we have to think about smart speaker skills. Is it helpful, and is it trustworthy? And especially when you think about all the things that they do that are not in the voice of the brand, they're in the voice of Alexa, they're in the voice of Google, and you're working in those parameters and making that consistent. So, it's absolutely a challenge. I think we have to put our worst instincts behind us and actually help people. Anna: It's so funny that you mentioned that, because you're right. I mean, people have been conducting experiments with Facebook, where they've had random conversations about cat food when they don't have a cat and then all of a sudden somehow they get cat food ads. I mean, there's always this underlying suspicion of this amazing piece of technology that is "free", and what is it actually, what is the true cost of actually this technology? I love your message of just trust, because there are no such things as really ads right now with voice search. Google Home isn't going to be serving you, it's 10:30 in the morning brought to you by Purina. Also, your point about being genuinely helpful, like the Butterball Hotline. I mean, I think if people just continue and marketers just continue to go this way, we can use these things in ways that actually reach our audiences in meaningful ways, and it develops even more trust with us and that trust transfers. Tom Webster: And I think there's a real opportunity for interactivity as well. I mean, a lot of the content that content marketers produce in video form or in text form, I mean, it is not interactive. Maybe there are things you can click on, but there's no user-driven path here. And this is starting to be possible and starting to happen more and more with smart speakers. Two of the examples that really come to mind here, Purina has a breed finder which you answer some questions and it tells you what your perfect breed is, and that's brought to you by Purina. It's not overly laden with the advertisements, but you certainly know it's a Purina thing and it's fun. Then there's also the Zyrtec allergy cast, is one of my favorites, which will tell you in excruciating detail why you shouldn't go outside. I've learned about rhizomes and channel blasts and all kinds of words I didn't even know. I basically haven't left my apartment in nearly six months because of Zyrtec allergy casts telling you that, and there's no over advertising for Zyrtec on there. But it is a thing that does what it says on the tin. It's a thing that tells you how bad is it going to be out there. And, thanks Zyrtec for telling me that. Again, it's that helpfulness, that trustworthiness. It's not ruined with advertising, but I'm aware of who's doing it and I'm grateful for those services. Another great, this is one of the best pieces of content I can think of is, it's a podcast but it works great on smart speakers called Chompers, and it is exactly as long as children should brush their teeth for. It's basically a guided toothbrushing with a fun game or activity. And if you've got a five-year old or a six-year old or a 30-year old, whatever, who you struggle with getting them to brush their teeth correctly, you throw on Chompers every day and they get something fun to think about. And they also get told, "Now switch to the top left." It's a super piece of content marketing and it's helpful. Anna: I want that now, just for me. Tom Webster: I've been brushing all along. I mean, now with [crosstalk 00:22:43] Chompers, yeah. I've really come to relearn oral hygiene. Randy: It's a lot of fun all of this stuff. It reminds me a lot, and we had a podcast [00:22:52] where we ended up talking a little bit about that Bandersnatch movie, right? The one with- Anna: Yeah, yeah. Randy: [inaudible 00:22:58] adventure. And I think that's a lot of these examples you're talking about. We want that interactive ability to choose our next step, choose our destination as to where we're going. And I think that's what a lot of these games, if you will, I don't mean to minimize them, but they're ultimately games that we can build content into that create this interactive opportunity. But I want to switch for a moment to something where there's elements of these speakers that are less interactive. They're very results driven. Right? I've kidded sometimes that we used to say, "The best place to hide something on Google was page two of the results." And when I went there, now it's result two, because if I asked my smart speaker how to make poached eggs, they're just telling me. They're not asking me, "Which of the following five results?" I just get immediate answers. What would you say is really the implication here for marketers from a search perspective, where we don't play the game, if you will? Tom Webster: Well, the degree of difficulty here is ramped up quite a bit, because it's not enough to have top-of-mind awareness. You need top-of-mind preference. Printer toner could evolve to be 6 million times better than it is today, and I'll never know, because I just keep asking, "Alexa, reorder my toner." It doesn't really matter, that part of it has been commodified. And you are right that it is now result one. And one of the things that all of the leading voice assistant technology manufacturers are really keen on, are failed requests. Studying failed requests and making sure that people aren't getting frustrated with the devices. Right now, people aren't really getting frustrated with the devices, because even though there are failed requests, people aren't expecting great things out of these. I think most people are surprised. In fact, I know most people are amazed by what they can do rather than frustrated by what they don't, or what they get wrong. But having that strong brand, that strong top-of-mind preference, is something you have to do off the device in order for people to find you on the device. But again, I think that's where skills really come into play, because if you're just trying to be search result number one, if someone's looking for a given product, that's one thing. But, if you can actually design and develop a skill that makes you the thing that people ask for help about, that's a strong play. So, again, skills are really, really important there, and maintaining that trust and maintaining that helpfulness. Anna: Nice. I feel like there's no better way to end a podcast session than to drop the mic like that. Tom, we could spend all day talking about this report and talking about smart speakers and what this means for the future of marketing and just tech within our lives in general. But I'm sure people at some point would actually love to read this report. So, where can they actually go download the report that we've been talking about this entire time? Tom Webster: All right, now I'm going to bring it all home with the content marketing aspect of this, right? And this is sort of the meta play. You can download this at npr.org/smartaudio and this is research as content marketing. It's been downloaded gazillions of times and NPR, and obviously we as well, get associated with it and as long as we keep doing it right and it keeps being accepted as currency, it's a piece of content marketing. Is a piece of content marketing for both of us. So yeah, npr.org/smartaudio. Anna: Nice. And then what else do you have coming up, just so people can stay tuned and take a look on the horizon? Any other big reports coming up? Tom Webster: Yeah, I mean, since this is a pod cast, as the kids call it, we do a lot of research in all things audio, not just smart speakers, but also podcasts and online media and things like Pandora and Spotify and even audio books. Our flagship study, our annual omnibus currency data on all of that, is a study that we put out every year in partnership with Triton Digital called The Infinite Dial. And The Infinite Dial 2019 comes out on March 6th and that's going to have as really eyeopening, surprising new data on things like podcasting of which this is one. Anna: How very meta. Fantastic. Okay, everybody, go check out the report, the smart speaker report. Go check out that flagship report. It's always going to be amazing and interesting. Tom, I loved talking to you today. I love digging through the reports and actually getting to dig into more detail with you about it. Before we let you go though, we would love to chat with you about a little bit of a full personal side of Tom. We got to know you on the professional side. We've got talked about a lot of data, a lot of statistics, but Randy has some fun questions queued up for you. So, if you wouldn't mind sticking around- Tom Webster: This better be fun. Anna: It will be. Oh, it always is. Tom Webster: This better be fun, Randy. Anna: Randy always says random questions, so I'm sure it'll be a blast. All right, everybody. Stick around and we're going to [inaudible 00:28:09] chat a little bit more with Tom right after this. Randy: All right, Tom, thanks for sticking around. We want to get to know, what is Tom doing when there's people moving into his house watching from afar in a very creepy way? I'll first share with you, my kids have all of a sudden found this new game on their smart speakers called Akinator. You guys played this? Tom Webster: No. Anna: No. Tom Webster: No. Randy: It's basically 20 questions where Akinator, which is this genie guesses the famous person that you've chosen in your mind. It's like, "Is it a male, is a female? Is this person over this age?" Before you know it, it magically knows the answer. Pretty cool. What is one of those fun or silly or stupid things that you were personally using your smart speaker for that none of us would have been aware of? Tom Webster: Wow, that's a good one. Something I'm using the smart speaker for that is fun or random that you're personally unaware of. Do you know, it's a really small thing. We do the same three things every morning. We are such creatures of habit. And the first thing that we do when we walk into our kitchen is say, "Alexa, good morning." And every day there's something goofy. I mean, Alexa has a very finely tuned, goofy sense of humor that they do a great job with there. We always start with, "Good morning." I don't know how much fun that is, but there's always something goofy or funny or stupid. We start with good morning, second we listen to Up First and then third we put on some music after that. Try "Alexa, good morning" sometimes and see what that has to say. By the way, obviously, I've had to change the name of our device to not Alexa because I do so much of this. Randy: That's hilarious. Anna: That's true, otherwise it would just be going off in the background every- Tom Webster: Constantly. Yeah, it took me months to figure that out by the way, or at least to get off my duff and do it. I was constantly like, "Shut up, Alexa, shut up." Randy: Is as great as [inaudible 00:30:15] I'm sure you've seen it, Tom. Tom Webster: Yes, yes. Randy: The older individuals don't know how to pronounce Alexa, it's the Alexa that can adapt to various games. Like Alexia, Alexis. It is priceless. Tom Webster: I'm going to set mine off now sort of on purpose, but we changed ours to "Echo" and what we have learned accidentally over these many months of owning it, is it will respond to "Gecko." It will respond to "Prosecco." Any number of ways you can accidentally ruin your day. Randy: That's amazing. I'll leave you both with this one funny, this literally happened this past week. I found out, which I didn't know that these smart speakers can actually act as telephones. I don't even know if it's proper to call it a telephone, but they can make outgoing calls. It finally got me to the point where it was like, "I am cutting the cord, I'm cutting my home phone line. I am getting rid of it." And the funny thing that went on from there, because I didn't want to give up a phone number, I wanted it to park it somewhere. I went through this whole app to do so and then I get to the point where they're like, "Okay, to verify we need to call you." And I realized I don't actually have a functioning home phone to accept the call. I had to call my dad to bring over a phone from his house, so that I could just accept the call so I could cut the cord and move fully to a smart home. Anyways- Tom Webster: #first world problems. Randy: Exactly, exactly. It's definitely a different world we're living in. It's an exciting one. Tom, thanks so much for educating us on the trend and we have to think about as marketers. I hope everyone's enjoyed this podcast on behalf of Anna, Convince and Convert, I'm Randy from Uberflip. We've had Tom Webster join us, and this has been a delight. Until next time, thank you so much for tuning in to the Conex Podcast.